1 Kg Pumpkin, peeled & cut into bite sized chunks. 1 Red Capsicum, deseeded & cut into strips. at approx. 220oC for 25 minutes, turn and cook for a further 25 minutes. 1 Punnet of Baby Roma Tomatoes. Place in a separate tray and bake for 20 minutes. Remove and cool. In a large salad bowl, place Baby Spinach, toss with a small amount of Olive oil. 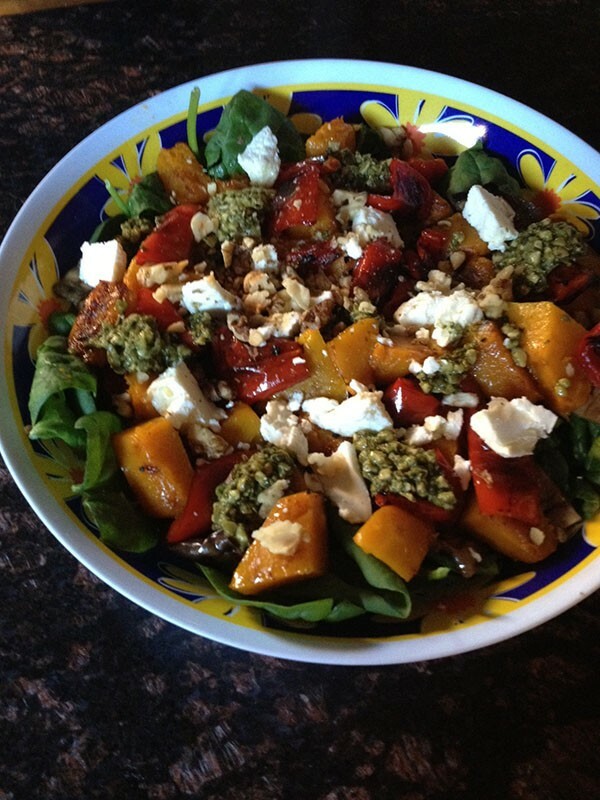 Add all the cooked ingredients on top, then dress with the Pesto, Walnuts and Goat Cheese. A great meal in itself or serve with fresh crusty bread.